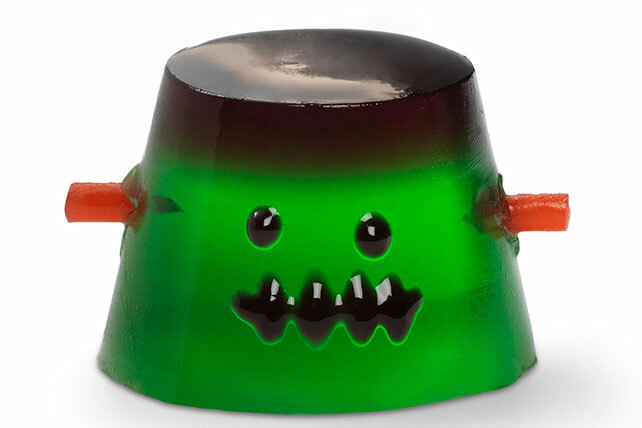 Bring wiggling, jiggling, dancing monsters to your next Halloween bash with Monster JIGGLERS. When kids see Monster JIGGLERS on the Halloween treat table, they won't be able to help busting a move to grab one! Spray 16 (1-oz.) plastic shot glasses with cooking spray. Add 1-1/3 cups boiling water to lime gelatin mix in medium bowl; stir 2 min. until completely dissolved. (Do not add cold water.) Refrigerate 12 to 15 min. or until slightly thickened. Meanwhile, add remaining 1/3 cup boiling water to grape gelatin mix in small bowl; stir 2 min. until completely dissolved. Spoon about 1-1/4 tsp. into each shot glass. Let set 5 min. Spoon lime gelatin over grape gelatin in glasses. Refrigerate 3 hours or until firm. Unmold JIGGLERS onto tray just before serving. Insert 2 licorice pieces into opposite sides of JIGGLERS for the neck bolts. Decorate with gel to resemble monsters as shown in photo. Substitute boiling tonic water for half of the tap water. The quinine in the tonic water will illuminate the JIGGLERS under black florescent party lights. Add 3/4 cup boiling water to remaining grape gelatin mix in medium bowl; stir 2 min. until completely dissolved. Refrigerate 8 to 10 min. Add 1 small apple, chopped; refrigerate until firm. Makes 2 servings.